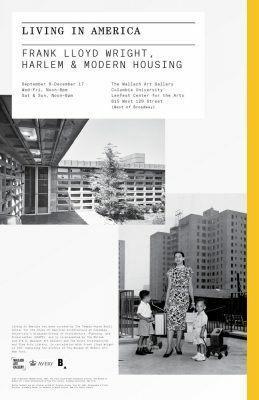 Living in America: Frank Lloyd Wright, Harlem, and Modern Housing is curated by The Temple Hoyne Buell Center for the Study of American Architecture at Columbia University’s Graduate School of Architecture, Planning, and Preservation (GSAPP), and is co-presented by The Buell Center, The Miriam and Ira D. Wallach Art Gallery, and Avery Architectural and Fine Arts Library. The exhibition is presented in correlation with Frank Lloyd Wright at 150: Unpacking the Archive, currently on view at The Museum of Modern Art, New York, until October 1, 2017. The Frank Lloyd Wright School of Architecture has had a tough few years. 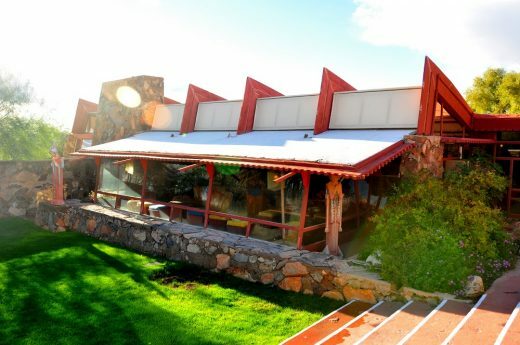 Located at the historic winter home of Wright, Taliesin West, the school almost lost its accreditation because it wasn’t financially independent from the Frank Lloyd Wright Foundation. Things got so bad that they temporarily suspended new enrollment, reports archinect. Then, the critic Aaron Betsky took over the deanship (in 2015) and was able to raise enough funding to keep the school accredited. Now, to mark their new, more-removed relationship to the Foundation, the school has been renamed the School of Architecture at Taliesin. After years of uncertainty, the Frank Lloyd Wright School of Architecture has had an application approved that will enable it to remain accredited, reports archinect. 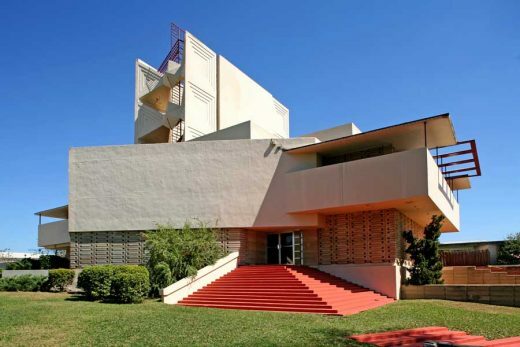 Previously, the school’s accreditation was threatened because it wasn’t operating independently of its sponsoring organization, the Frank Lloyd Wright Foundation. The application that was approved enables the school to separate itself from the Foundation while still using its facilities. 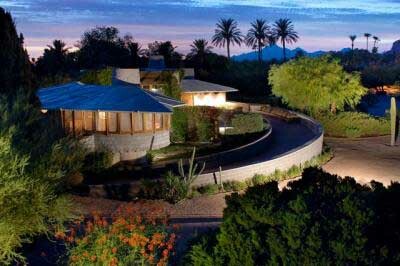 The final home that Frank Lloyd Wright designed has just gone on sale. Plans to build the first house in Britain designed by the renowned 20th century American architect Frank Lloyd Wright, report the Daily Mail: Engineer Dr Hugh Pratt and his wife have been granted a licence by the Frank Lloyd Wright Foundation to use a design originally created in the 1940s for a site in California. The plans were never used but if approved by planners the proposed property would be built on a plot of land south of Bristol. It would be the last house designed by Wright to be built anywhere in the world. Architect Stephen Brooks (based in Bath, Somerset) has been working with the FLW Foundation to reconcile the original plans with current building regulations. We reported earlier that this Frank Lloyd Wright house was at risk of demolition by developers. The good news – we are happy to report that The David Wright House is Saved. 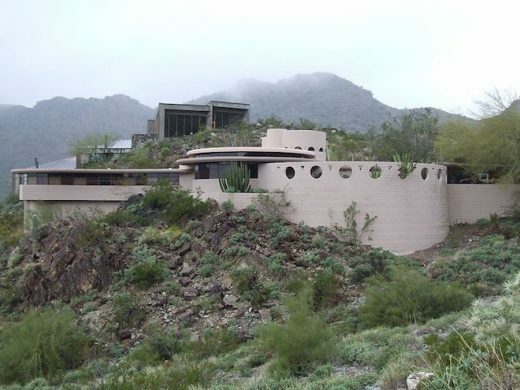 The Frank Lloyd Wright Building Conservancy has facilitated the purchase of the David and Gladys Wright House in Phoenix, Arizona, through an LLC owned by an anonymous benefactor. The transaction closed on December 20 2012 for an undisclosed price. We reported back in August that The David and Gladys Wright House, designed for FLW’s son, is at risk of demolition by developers. The good news – we are happy to report that the Phoenix Historic Preservation Commission voted unanimously to recommend Landmark designation for the building. The Frank Lloyd Wright Building Conservancy (based in Chicago, Illinois) has awarded a temporary demolition delay while the City of Phoenix decides whether to bestow historic preservation and landmark designation upon the house. The Museum of Modern Art, Columbia University and The Frank Lloyd Wright Foundation announce that the archives of Frank Lloyd Wright have been jointly acquired by the University and the Museum and will become part of their permanent collections. The Frank Lloyd Wright archives include 23,000 architectural drawings, 44,000 historical photographs, models, manuscripts, correspondence and other documents. The Frank Lloyd Wright Foundation will retain copyright and intellectual property responsibility for Wright’s body of work. 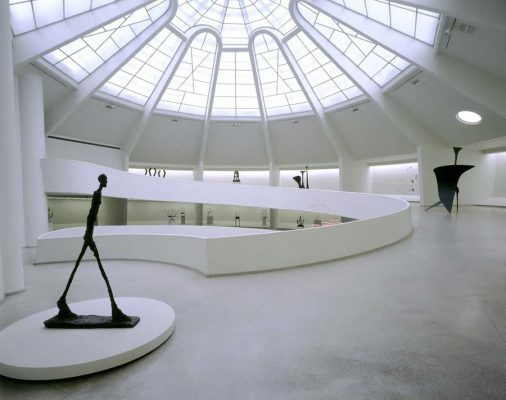 In 1953, six years before the Frank Lloyd Wright-designed Solomon R. Guggenheim Museum opened to the public, two of his structures—a pavilion and model Usonian house—were built on the future site of the museum to house a temporary exhibition displaying the architect’s lifelong work. From July 27, 2012, to February 13, 2013, the Sackler Center for Arts Education at the Guggenheim Museum will present A Long-Awaited Tribute: Frank Lloyd Wright’s Usonian House and Pavilion, an exhibition comprised of selected materials from the Solomon R. Guggenheim Museum Archives, highlighting the first Wright buildings erected in New York City. Designed while Frank was working for Adler and Sullivan Architects in Chicago. Key example of the Prairie Style house. This is Frank Lloyd Wright’s most famous and spectacular building. The house boldly cantilevers out over a beautiful waterfall. 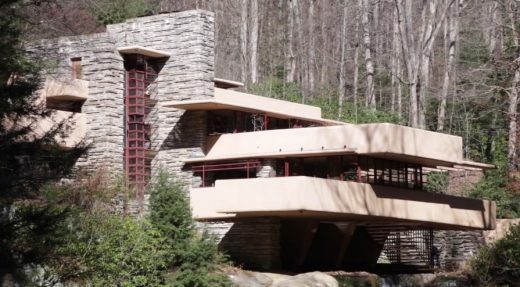 Fallingwater voted American Institute of Architects Best American building of last 125 years. August 29, 2017 in Architects.